Let me start by saying that the products featured in this post were provided to me free of charge courtesy of Charlie’s Classic Cooking, but this in no way influences the review to follow. We have busy days around here – Jason works 10 hours a day and I work 12+ hours on this blog each day. Between him and I, the idea of having to cook after a long day is a little more than exhausting. Most days we gravitate towards the easiest thing to cook, which is usually chicken. I can tell you from experience that chicken does get tiresome, there are only so many ways to cook it. It is no secret that as a blogger I get some unique opportunities for not only review but events and experiences. Jason and I have talked for a while about the concept of food being pre-made and put in the refrigerator for heating when we are ready. There has been a hesitation in us, that was until I had the opportunity to finally try this method of meals. 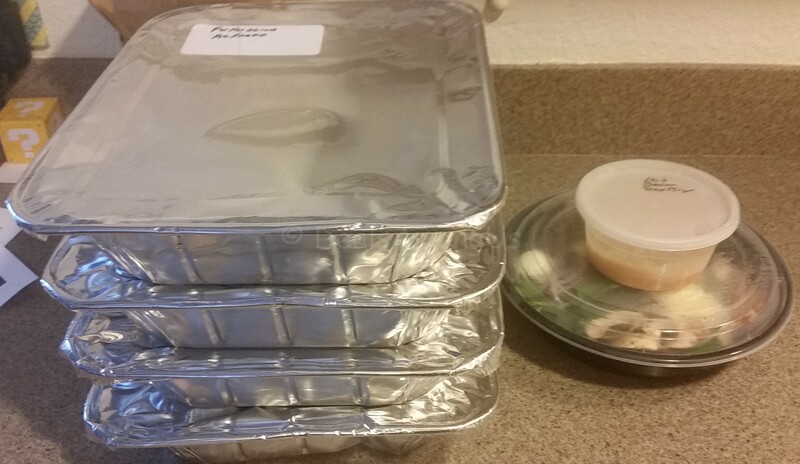 I was lucky enough to get 4 days, which was the equivalent of 16 meals, from Charlie’s Classic Cooking in Escondido. What is Charlie’s Classic Cooking? Charlie’s Classic Cooking is the catering company run by Charles “Charlie” Heineke in Escondido, California. Chef Charlie is a native San Diegan is passionate about food and shopping local markets for the freshest sustainable fields. Chef Charlie started his career as a dishwasher, and he quickly moved up to line cook – while completing his education in food service production and then later in food service management. During his 15 years as a chef of Mission Bay Hospital he developed dietary programs tat met the demands of patients, staff and visitors. Implementing his 25 years of experience gives Chef Charlie a unique over others. Click here to read more about Chef Charlie! Charlies Classic Cooking offers Meal Plans (full meals delivered to your door), Cooking Classes (this is for friends and family to learn to cook), Cooking Club (this is for YOU to learn different cooking techniques), Catering (offers a variety of catering options) and Kitchen Rentals (a certified fully stocked commercial kitchen is available for rental/use). Tuesday – Shepherd Pie with Mashed Potatoes and Spinach Salad: I had never had Shepherd’s Pie before and truth be told I looked it up. Shepherds Pie is basically meat pie with a crust of mashed potatoes. This particular meat pie was very tasty, and the meat chunks were a good quality meat – no overly chewy. The mashed potatoes where really good, and I chose to mix the two components and it was really good. Both Jason and I had leftovers the next day and this was just as good. The Spinach Salad had bacon. onions, mushrooms and almost a whole egg. This came with a bacon dressing that tied the meal together. 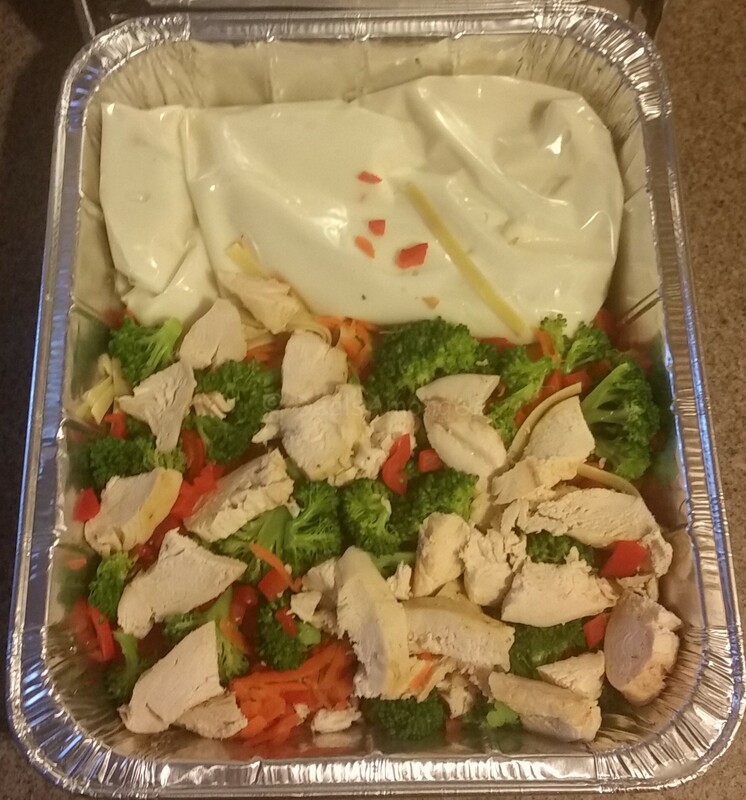 Wednesday – Fettuccine Alfredo with Carrots, Broccoli and Red Peppers: This was so good. The sauce came packaged separately in a Ziploc bag, which was nice as we were able to control the amount of wetness our Alfredo would end up with. The vegetables were crisp and so bright and fresh. I loved that the broccoli had a snap to it, and the noodles were cooked perfect. This would have been really nice with some re-heatable garlic bread, but a well-balanced meal none the less. 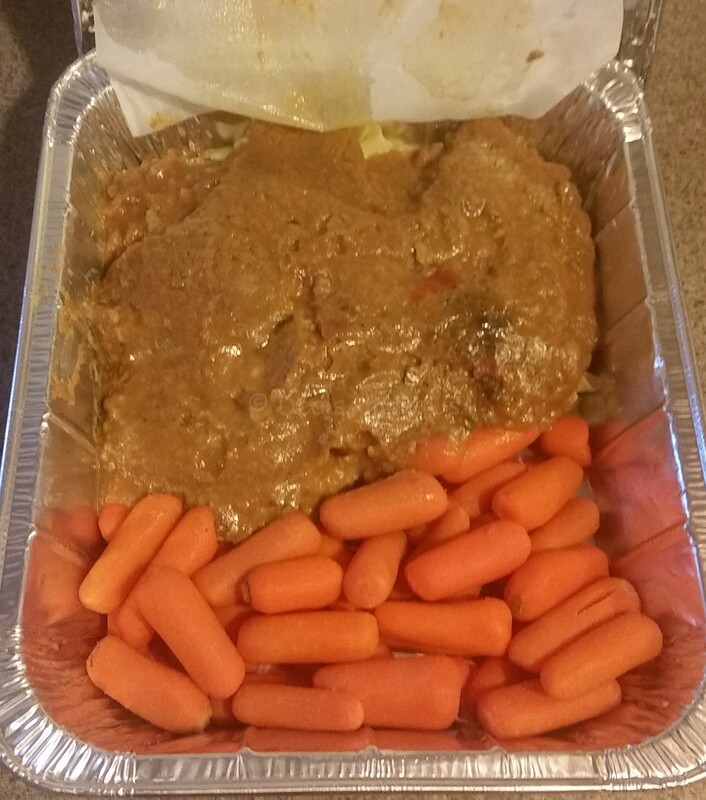 Thursday – Swiss Steak with Egg Noodles and Baby Carrots: I had never had Swiss Steak before this so I went in knowing that it was a steak of some variety. Turns out that Swiss Steak is simply meat with a mushroom sauce that is cooked in either the oven or stove. This ended up being really good, The carrots were really good, and crisp – obvious that they were very fresh. 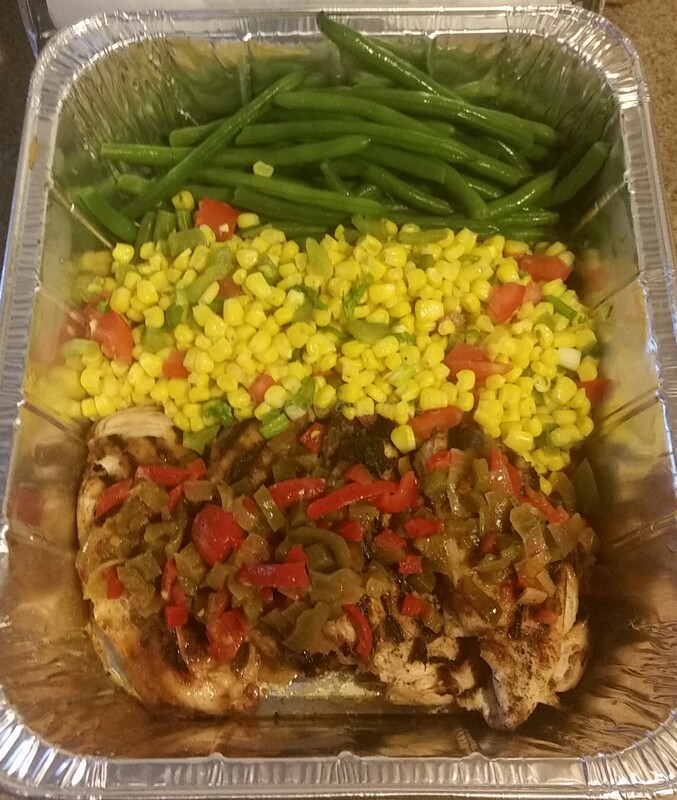 Friday – Lime and Cumin Grilled Chicken with Tomato-Corn Relish and Fresh Green Beans: This was my least favorite of the 4 days, but that is not to say it was not good. This tasted of lime and cumin and smelled so good when heated. The chicken was not over cooked and it was tender and very tasty. Delivery was made on Tuesday afternoon by Chef Charlie himself. The first thing he did was introduce himself to me, and I immediately knew this was a likable person. 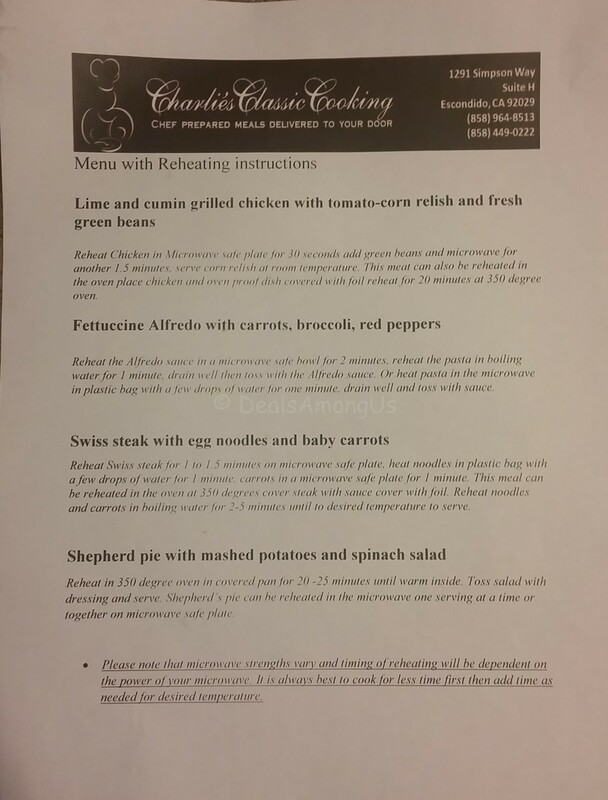 Chef Charlie made sure that I received reheating instructions and was easier and ready and answer any questions I had. The only question I asked was if it was safe to keep the food stored in the fridge or freezer. The only criticism I had was that had we been feeding 4 people I worry if there would have been enough. The servings were a little on the low-end and we both would have liked to see a little more food included. The servings were balanced and we felt like the had the most balanced meal we had in a while. I plan on making this a couple of year treat for Jason and I, it was nice to not think about dinners and know we were getting a nutritiously balanced meal that tasted delicious! Upcoming: 6th Annual Oktober Fest Cooking Class and German Feast! Charlie’s Classic Cooking will be hosting its 6th annual Oktoberfest Cooking Class and German Feast, Saturday, Oct. 10 at 6:30 p.m. – complete with the traditional German fare, and lots of brats (and beer), plus some Hot Apple Strudel. The menu will be made up of Wiener Schnitzel – veal cutlets pounded, breaded and fried – Bratwurst; Spätzle, a small German dumpling with braised red cabbage; and German potato salad. Following the cooking class and demonstration, guests will enjoy the full meal and beer to taste, sponsored by local breweries. The annual event is $50/per person or $90/a couple. Held in the kitchen and enjoyed just outside, Chef Charlie’s kitchen is located at 1291 Simpson Way, Suite H (Escondido). GIVEAWAY: Charlies Classic Cooking is giving one dinner to one person/family! (1) lucky winner will be selected at random to win 1 dinner for 4 people delivered to your home. This is a $75.00 Value!!!! I will be randomly choosing 1 person October 30 (10/30/2015) to receive this easy meal! Open to residents throughout San Diego County. To enter complete the entries below! Winner’s will be notified by me by email and prize will be fulfilled by Charlies Classic Cooking in Escondido, CA. Remember you have 48 hours to claim prize, or I will choose another winner. GOOD LUCK!!! Win 1 Dinner for 4 Delivered to your Door! This entry was posted in Giveaways, Reviews and tagged Food Delivery, Food Review, San Diego Business, San Diego Events on October 5, 2015 by Jennifer.